Remember when you were a kid playing hide-and-seek on a warm summer night. Nothing could beat the thrill of sneaking around in the dark trying to tag your friends while they tried to escape. 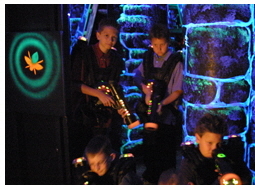 That memory gives you just a glimpse of the thrill you and your kids will experience playing Laser Tag! If you think playing a space-aged video game is fun, then picture yourself as one of the characters in the game, tagging opponents with your laser in a room that makes you feel like you're somewhere in another land - a land called Laser Quest! When everyone in our party arrived at the Laser Quest in Fullerton, California we made our way to Mission Control to be checked in. There were nine of us in our party, but Laser Quest can accommodate up to thirty players with ages ranging from 7 to as old as 77! 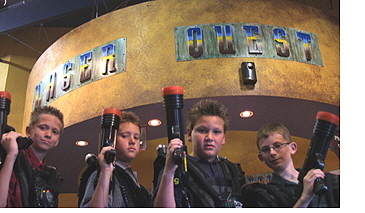 In fact, Laser Quest encourages moms, dads and the other family members to join in too. 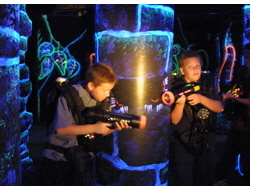 You can even reserve the whole arena and keep it private for just your party - Laser Quest offers lots of choices. As we checked in, we picked our own nicknames like Cowboy, Time Bandit, Yoda, Flash, etc. while the Laser Quest representative entered them into the computer. 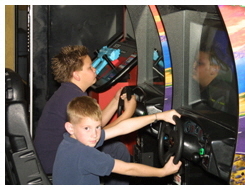 The Laser Quest computer system tracks everyone's scores and ranks your performance compared to all the other players as soon as the game is over. Once everyone was checked in, we proceeded to the Briefing Room entering through a doorway that looked like it was part of an ancient Aztec ruin. In the Briefing Room our Marshal (Laser Quest Guide) gave us a complete explanation of how to operate the laser tag equipment, the game rules, the safety rules and what to expect once inside. From the Briefing Room we moved into the Air Lock. The Air Lock is where everyone is outfitted with their laser tag gear. We walked into the Air Lock and gave our eyes time to adjust - it was very, very dark. 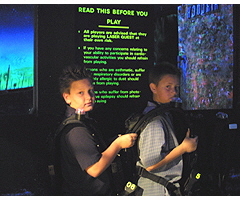 Looking around the room we could see the walls were lined with laser tag vests. We each picked out a vest and powered up our lasers. We were ready to go. At the end on the Air Lock was a large metal rollup door. This was the entrance to the arena. As the door opened, we all made our way out into the arena. The Laser Quest Marshal came with us as our guide and resource if we needed help or assistance. The arena is actually a giant two-story maze with over 7,000 square feet to roam around in. Some Laser Quest locations are even bigger! This maze is actually a network of walkways that twist and turn throughout the arena. Most of the walkways crisscross each other while others lead to ramps that take you up to the second level. Its incredible how well you can hide and sneak around undetected, even when there's thirty players inside. The arena is filled with walls and pillars that are painted with glow paint in an ancient stone and Aztec style. They glow all around you as you make your way through the maze. Many of the walls have holes that allow you to peer through and tag players as they try to sneak up on you. And on the second level, some floors have metal grids that allow you to tag players below you, or above you. During our game, my favorite tactic was to hide in one spot and tag players as they helplessly wandered into my trap! At one point, I was on the second level and noticed that the room was filling with a light fog. This was really cool! As we blazed our lasers you could actually see the line of light streaking across the room! ZAP! When we heard our lasers beeping, we knew the game was over and we all headed out to return our gear. As soon as we walked outside, we were able to see our scores on the overhead computer screen. Within a couple of minutes, our Marshal came over and handed us our personalized scorecards that showed our score, who we tagged and who tagged us. For our party, we played two games of laser tag and then retired to our private party room. Our party room had two large tables that could hold around 20 kids. All of the kids ate pizza and talked about the exciting laser tag action back in the arena. Before moving onto the cake, ice cream and presents, we let all the kids spend some time in the arcade area. 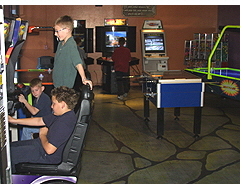 There was foosball, air hockey, a race car game and a laser game, just name a few. As the kids played in the arcade, I browsed through the flyers and brochures available at the Mission Control desk. 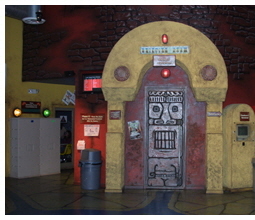 I saw that not only does Laser Quest do birthday parties, they also have a learning program called "Quest for Knowledge" that teaches kids about lasers and mazes and a corporate team building program called "Quest for Success" that help businesses develop high performance teams.